Have fun Pam! Your dinner plan has my mouth watering.... sounds delicious! Rub it in...still freezing, here. That is the perfect patio in my book. Have a fun girls gathering. I am too so ready Pam! We are still in the low 40's here but I'm getting excited for patio weather too! Have fun tonight! That sounds exactly like my perfect order for appetizers, too. Have a great time. Good luck this weekend with the final push on the ORC. I sure could use some warm weather and sunshine over here.. Sounds like a great Friday to me! We still have snow in the forecast here and lots on the ground....I am longing for those 72 degree days! That is a gorgeous patio, Pam! I miss the patio we had at our old house. I have a small covered area to sit outside at here at our new place. Perfect meal for me too! Denver has the BEST weather, it has been in the 20's all week and too windy for dog walks. Love the patio. Have a fun evening! Lucky lucky with that weather! Enjoy your night out, that sounds fabulous! Enjoy that warm weather. Have a great time with all your friends! You sure deserve a break! Have a fun weekend Pam! That patio is perfection. Sounds amazing...the din out with girlfriends and the 72! Enjoy!! Ahhhh, beautiful! 80 here today. Enjoy your dinner! Ah, lovely! A brisk 34 today. Hoping it warms up for the St. Paddy's Day parade tomorrow. So jealous of your weather, but seeing that patio gave me hope that spring will get here eventually. When it does, I'm shooting for purple and chartreuse flowers like those . . .
Love the patio! It's been perfect weather here the past week ~ sunny and high about 82'. Really brings on spring fever! Your night out sounds great...we all need that don't we? I call that grazing food and yes, I love it. Not too much, just right. :) Hope you had a LOT of fun! Is that slate you used on your patio? Hi Heidi! 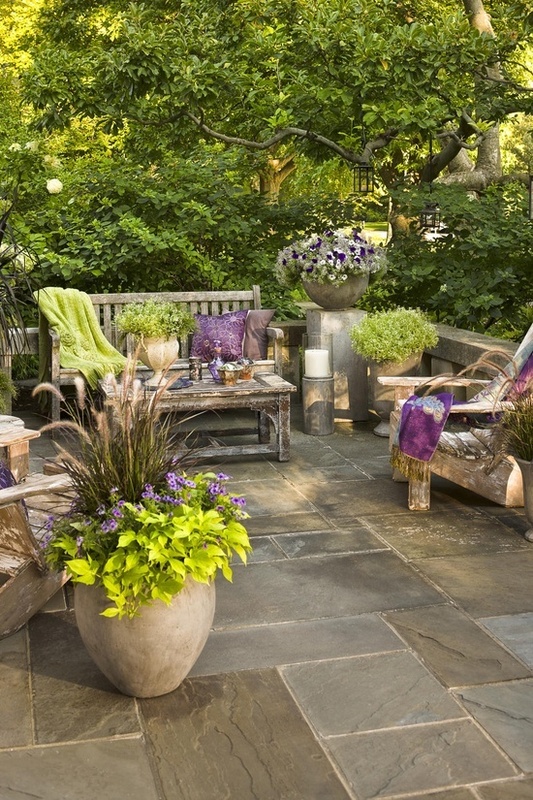 I wish that pretty patio was mine, I found it on Pinterest, so unfortunately I'm not sure what the material is.